If you remember, I've already featured three campuses and their chapels namely the Ateneo and the Church of the Gesu, La Salle and the Chapel of the Most Blessed Sacrament, and FEU and its chapel. 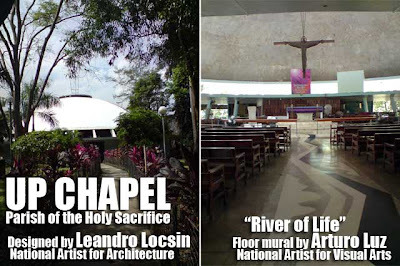 Now I'm featuring UP Diliman and its two chapels. The Catholic church of UP Diliman is the Church of the Holy Sacrifice or the UP Chapel. It is a National Historical Landmark and was designated an Important Cultural Property by the National Museum owing to the fact that it stands as a testament to the creativity of not one, not two, but four national artists! The dome-shaped structure, a fine example of Modern architecture in the Philippines, was designed by Leandro Locsin. 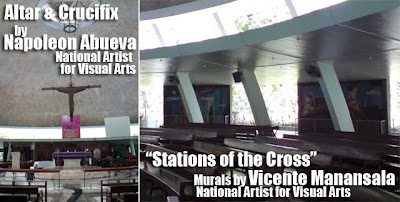 Around the UP Chapel are fifteen large murals painted by Vicente Manansala depicting the Stations of the Cross. The marble altar and the large wooden cross above it were sculpted by Napoleon Abueva. And finally, the mosaic floor mural called the “River of Life” was designed by Arturo Luz. Another renowned architect, Cesar H. Concio, was responsible for designing the neighboring Protestant chapel, the Church of the Risen Lord. Fantastic job on your travel journal. Very well done. I am sorry to have stumbled upon on it only now. The Protestant chapel in shell shape like that of the Sydney Opera is so similar to that one in Central Philippine University in Iloilo City. Accdng to my art studies teacher the patish of the holy sacrifice was originally designed for a rich family in a provincr in visayas however, it did not push through as the family had to move abroad. We' re happy to have it in campus instead. Like your blog. It's good you featured UP in time for the centennial celebration. @sherwin, thanks for dropping by. @wangbu, Concio was inspired by a Brazilian architect. I forgot the name but the church is patterned after one in Brazil. @thebignotebook, yes, I heard that story. Indeed, we're lucky to have it in UP. The Roman Catholic Church was originally designed for the Ossorio family of Negros. It is recorded that Ang Kiukok assisted Enteng Manansala as the apprentice when the murals were painted. So i guess it's 5 National Artists after all. The church of Holy sacrifice was indeed for the Ossorios of Negros. Alfonso Ossorio started the first sugar refinery of Visayas, which is the Victorias Milling Company. Sorry but is the father of Alfonso Ossorio who is the founder of VMC. 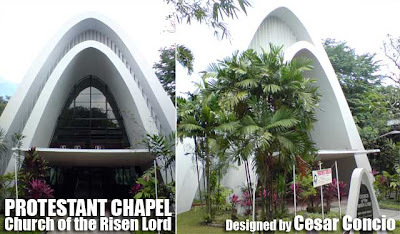 I wonder why critics slam Concio by saying he copied Oscar Niemeyer's St.Francis Church. I was looking at the design, similar but obviously different. And we know he went to Brazil to get inspiration from Niemeyer. It would be nice if the campus architect of UP Diliman becomes a national artist. sana post po kayo ng interior ng church of the risen lord..
Hehe! No, it is NOT Cesar Cancio. It IS Cesar Concio. Manila: World Pyrolympics 2008 postponed again! Manila: Bollywood serves great Indian food!